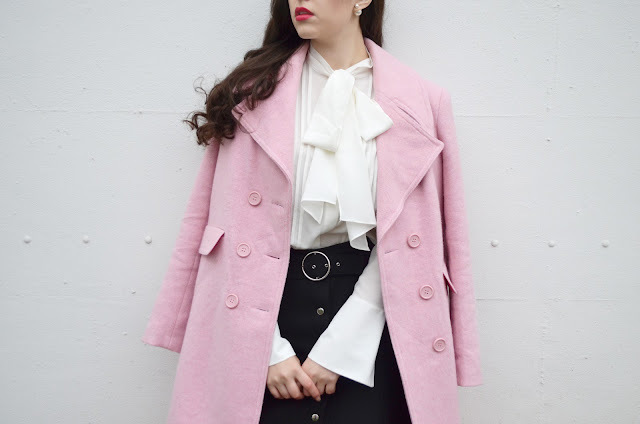 Coat: here. | Blouse: here. | Skirt: here. | Shoes: here. Umbrella: c/o Laurence Groux. Evidently, I decided to stop hovering over the 'confirm purchase' button and go for it, and all because of this beautiful Laurence Groux umbrella. The minute I unboxed it, I knew that this coat would perfectly pick out the flashes of pink, purple and gold in the pattern of the umbrella. Mine is the Audrey Umbrella, with a glossy, sculpted maple wood handle which I chose myself. I recently posted a photo of it on Instagram, and although it received a whole lotta love, it also received a slightly pointed but perfectly fair question; '$359 for an umbrella?' So, I wanted to address that in this post. 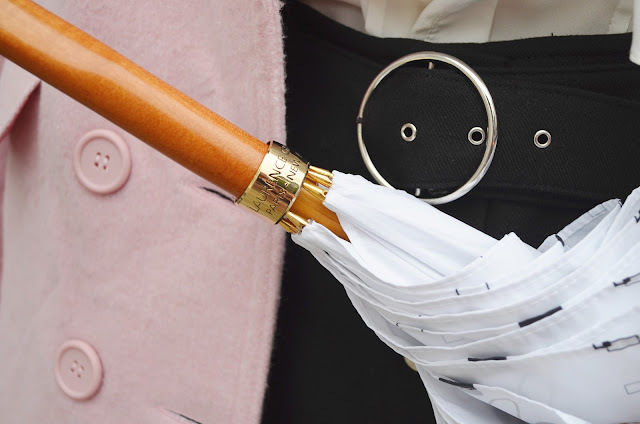 Of course, I fully appreciate that $359 is a lot of money to a lot of people (myself included) but I cannot stress enough that these umbrellas are true works of art in themselves. They are incredible pieces of handmade, traditional craftsmanship, and to me - this isn't something you'd buy on a whim (unless you're in a financial position to of course!) it's a special occasion gift and a once in a lifetime purchase. I know it sounds like I'm being rather dramatic about an umbrella, but there's definitely something particularly special in actually seeing and feeling the quality of one of these pieces in real life, so I've tried my best to capture this for you. 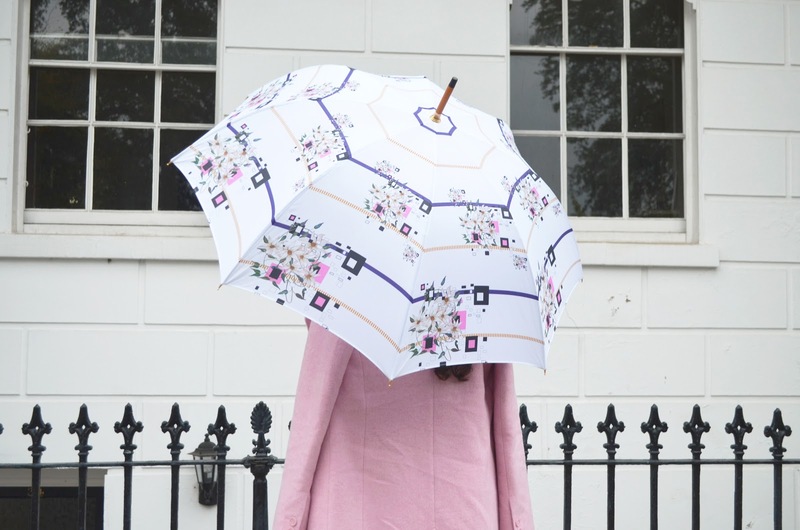 The pattern that spans the umbrella is detailed and intricate, and the handles (which you can choose and customise yourself) are hand sculpted, Italian wood. I think an umbrella like this is really something to last a lifetime. When they arrived (This is 1/2 - I have one more pattern to show you!) myself, my mother and my grandmother were all in awe - I think that's a rare achievement; to create something that appeals to 3 generations. Basically, Mary Poppins would've legit had one of these. So I'd love to know, what do you think of them? Would you love to receive something like this as a gift? I'd also like to express that Laurence Groux are not paying me for this review. Laurence generously offered to send me two umbrellas with a view to featuring them in an outfit post if I liked them. I have chosen to feature the umbrella of entirely my own accord, because I am so so impressed with them. I love this look from head to toe and the umbrella is indeed something very special!